Amazon.com description: Product Description: The perfect companion to the New York Times bestselling book by organizing icon Peter Walsh, the Itâs All Too Much Workbook delves deeper than the original book to help readers let go of the physical and mental clutter that is holding them back from a happier, more fulfilled life. 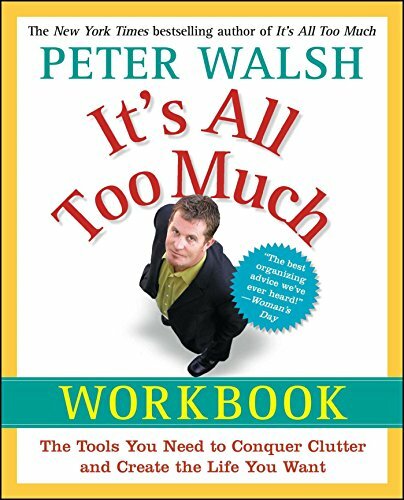 In his bestselling book, Itâs All Too Much, Peter Walsh helped tens of thousands of people clear the clutter from their homes and lives. Now, due to many of those same readersâ requests, Peter has put together the Itâs All Too Much Workbook. Designed with clear strategies and proven techniques for clearing out each room in your house and a plan for keeping your home clutter-free and organized, this workbook is the perfect next step in a lifetime commitment to creating your ideal life. Starting from the outside of your home and then working through it room by room, Peter asks hard questions and presents challenging exercises that will help you to understand why you live the way you do and how to move from the clutter to an organized space that reflects the life you imagine for yourself. From an assessment of your living spaces, a quick purge of each room, and the creation of your âdream spacesâ to effective decluttering techniques, great organizational tips, and clear maintenance plans, Peter provides the step-by-step help to make your home work for you, now. About: The perfect companion to the New York Times bestselling book by organizing icon Peter Walsh, the It’s All Too Much Workbook delves deeper than the original book to help readers let go of the physical and mental clutter that is holding them back from a happier, more fulfilled life.